LA CORSA is heading north for this exclusive tour, a brand new offering for the 2019 season. 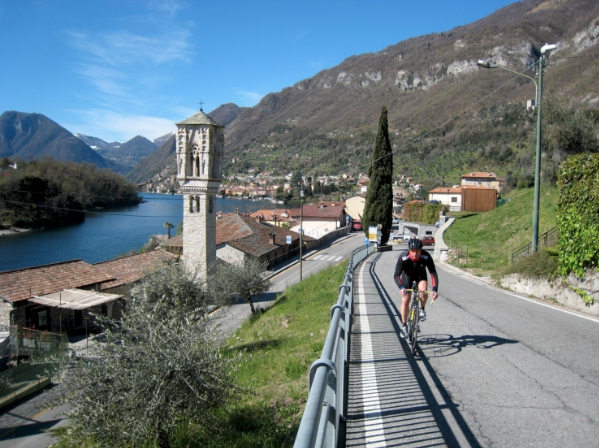 This new 5-night tour takes place near Milan and we will be cycling in the stunning surroundings of Lakes Como and Garda. The highlight of this tour is a visit to the historic De Rosa factory, and the opportunity to meet founder Ugo De Rosa and other members of the family. Find out about the fascinating history of the iconic bike that you’ll be riding, and the passion that made a 13-year-old Ugo De Rosa’s dream of building his own bike a reality. Discover how he built one of the most desirable and successful cycling brands in the world. Like the flagship Tuscany tour, this tour has been years in the making and everything will be to the high standard you expect from a LA CORSA tour. As well as exclusive access to the De Rosa factory the tour features the famous Maddona del Ghisallo climb used in the famous Giro di Lobardia race. 5 nights accommodation in 4* hotels. All airport pick up and drop offs. The north of Italy is renowned as the “working”or “Industrial” part of Italy where most of the big cycling manufacturers are based and is home of some of the top Italian pros and the biggest races.This tour we have aligned with Il Lombardia (The race of the falling leaves) which is one of the last big professional races of the season. You will get a chance to watch your favourite professional riders one day and then tackle a slightly shorter version of the same course the day after in the gran fondo. 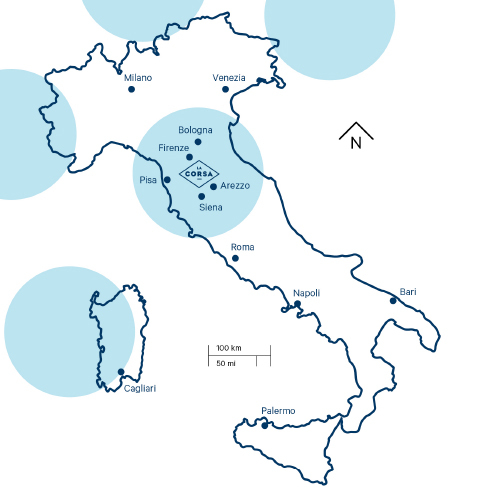 Unlike our other tours which offer a base and various routes all leaving and returning to the same place, this tour is very much an epic adventure across a stunningly beautiful part ofItaly. We start in the city of Verona which was home to Romeo and Juliet and still has the amazing amphitheatre similar to the colosseum in Rome. Lakes tour first day. (Verona to Garda) Breakfast in the hotel and then a relaxed departure time heading in the direction of Lake Garda. From the 25km point we arrive at the south side of the lake and follow the road round the lake right up to Riva di Garda. We will plan a stop for a light lunch when arriving at the stunning little town of Limone Sul Garda before continuing on to our hotel for the evening. After checking into the hotel we will have a bit of downtime before going out for our evening meal. Our second day on the bike is one for the climbers and will take us from the huge lake of Garda to the much smaller and less known Lake Iseo which is a little gem full of natural beauty and pretty medieval towns. The road to Iseo is certainly not easy and will feature 3 big climb stopping out at almost 1000m. In a little over 90km there is more than 2000m of climbing but fear not we will have van support right the way throughout the journey. On arrival at Lake Iseo our guests can choose to either simply put their feet up and relax or head out for the flat recovery ride around the lake. It’s a 60km loop with almost no climbing and amazing senery at every turn. Nobody said it would be easy and day 3 throws up another few challenges which are not for the faint of heart. 116km with 2500m of climbing will take us from our hotel near Lake Iseo to the start of Lake Como. This ride will take on some of the super famous roads used in the race of the falling leaves, Il Lombardia and only 1 day before the professionals will ride it. Race day is finally upon us and we will have a short morning ride to get to our hotel and ride to the famous Madonna Del Ghisallo to watch the professionals make light work of one of the iconic climbs of this area. This will be one of the pivotal areas where the race is decided. After we will have time to ride down to watch the finish. This day is really about letting the legs recover and soaking in the last Italian classic (Race of the falling leaves) before we get the chance to ride over the same stunning course the professionals have ridden the day before. The Gran Fondo Il Lombardia 2019 will take place on Sunday, October 13, 2019 with the professionals tackling the course on the Saturday of the same weekend. Starting from Como, it features 3 iconic climbs: the Ghisallo, the Sormano with Muro and Colma and finally, the Civiglio. Although the not the longest sportive but with 4 categorised climbs and lots of rolling hills it will be a challenging route. All 4 climbs max out at over 10% and the Muro di Sormano hits 27%. Expect stunning lake views at every turn. By evening time we will be dining out and eating our same body weight in food and wine to toast the success of what will be a stunning day out on the roads of Lombardia.